Round point at both ends with an eye at one end. For button work and hand stitching horsehair pads. With a bayonet point (triangle) at one end and an eye at the other. This needle is easier to pull through a denser pad (e.g., flock). Regulators in a lighter gauge are available in 6", 8", 10" and 12". 12"x5g needle. The most sturdy of manipulating needles you can buy. Broad at the eye end, tapering to a fine point. High quality. 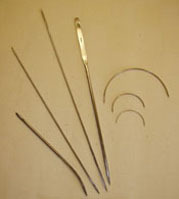 A needle of a heavy gauge for stitching springs, etc. Curved at the bayonet end with an eye at the other. Upholstery pins to hold fabric in place during hand stitching. If you only want to buy one size, buy the 4". 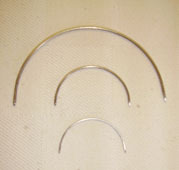 All skewers are nickel plated and are 16g.